David F. Swenson, a professor of philosophy at the University of Minnesota until 1939, is generally credited with introducing the philosophy of Kierkegaard to the English-speaking world. 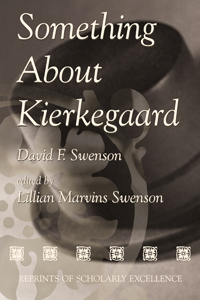 Convinced he had discovered a genius when he found the now-venerated Dane's works in a local library in 1898, Swenson decided to devote his career to the task of making Kierkegaard accessible to English-speaking students of philosophy. In 1914 he gave the first known lecture series in this country on Kierkegaard, and in 1916 he read a paper titled “The Anti-Intellectualism of Kierkegaard.” Subsequently published in the Philosophical Review, the paper is reprinted as chapter five in Something About Kierkegaard, a volume that has remained a standard since it was published by the Augsburg Publishing House in 1941. Given a new introduction, the valuable collection is reprinted here for a new generation of seekers after Kierkegaard.